By Oliver Van DeMille. An absolute must-read book! 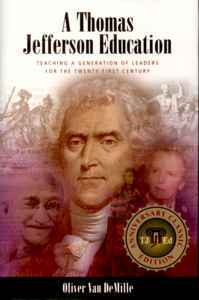 This discussion of leadership education accurately exposes the conveyor-belt training systems we currently see in institutional education, instills the vision of what true learning should be, and gives clear guidelines on how to recreate the educational experience of Jefferson and his contemporaries in our own home or classroom, through a combination of mentors and classics. Although philosophically rich and very inspiring, this book also provides practical answers and substantive how-to-really-do-it details that allow the reader’s zeal to flow right into application. Above all, it is a book that will permanently change your concept of what education can and should be. Required reading for every serious parent, teacher, or private school administrator. Click here for a testimony regarding how this book transformed one homeschool. 197 pages, hardcover. By Oliver and Rachel DeMille and Diann Jeppon. The core unit of society is the family, and it is in our homes that our values and virtues most deeply take root and flourish. Regardless of where your children sit to learn, your home ca be transformed into a Leadership Education Home, a Thomas Jefferson Education environment. This volume offers something new, something which we all need: a view of Leadership Education from many angles, from the education of toddlers to advanced adult learning. Whether you’re a parent, teacher, administrator, legislator, professor or grandparent, this book is a must. By John Gatto. You must read this book! Gatto shows how most of us have been so molded and conditioned by our own education that we can’t even begin to see the box that shaped us. This book reveals much. Tracing the philosophical and sociological roots of our system of compulsory education back to the German psychologists, back to the Prussian elitists, and even back to the Spartan disciplinarians, Gatto masterfully exposes some of the most fundamental factors that shape schooling today. Gatto’s documentation is extensive and impressive. We can only begin to comprehend the real reasons of why things are the way they are in the country today when we see the deep historical entanglements of social engineers and education reformers. Furthermore, we can’t often see a different way of doing things in our own teaching until we begin to shatter the box that we grew up and have lived in all our lives. This book does just that. By John Taylor Gatto. In 230 pages of dynamite, this NY State and City Teacher of the Year combines material from when he was still in the classroom with his striking research and analysis of recent years. The chapter ?Nine Assumptions and Twenty-One Facts? is alone worth the price of the book. Other chapter titles include: "Why Do Bad Schools Cost So Much?" "A Year with John Taylor Gatto," "Confederacy of Dunces," and "Schoolbooks and the Hidden Curriculum." The last two chapters give Gatto’s ideas about "The Art of True Conversation" and his definition of "The Educated Person." Successful entrepreneur and home school dad Steve Beck gives step-by-step help for any young person or family who wants to get going in the world of business. Takes teens and their parents through an entire planning session, giving key pointers and mistakes to avoid. In addition to 8 hours of taped instruction with a live audience, you will receive a 63 page workbook on CD-Rom with reprducible worksheets, homework and checklists for future business ideas. This workshop has everything you need to help your teens (or yourself!) get set up in their own business. The seminar begins by exploring possible business ventures and then proceeds to explain, step by step, how to get started from set up to advertising. A great gift for a motivated young person, and as with all our other products, 100% money back guaranteed.